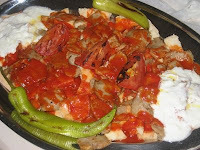 especially around Bursa city..iskender kebaps are very special and taste. 1. Warm the pide by placing on a barbecue grill and keep warm. When all other ingredients are prepared, slice the pide into 3cm squares, divide into 4 portions and place as a layer on each plate. 2. Crush the garlic and add to the yogurt, mix well adding a little salt to taste. Spoon onto the pide squares just before adding the doner kebab slices. 3. Heat the doner kebab quickly taking care not to allow the strips to become too dry. 6. Mix the tomato puree with the olive oil and cayenne pepper and heat in a small pan on the grill. Add salt to taste.